Pelagic birding for migrant petrels and shearwaters and a chance of Indian Ocean rarities. Barau’s Petrel; Bulwer’s Petrel; Jouanin’s Petrel; Streaked Shearwater; Wedge-tailed Shearwater; Wilson’s Storm-petrel; Swinhoe’s Storm-petrel; Matsudaira’s Storm-petrel; Christmas Island Frigatebird; Pomarine Skua; Arctic Skua; Long-tailed Skua; Bridled Tern; Sooty Tern; Brown Noddy; Aleutian Tern. 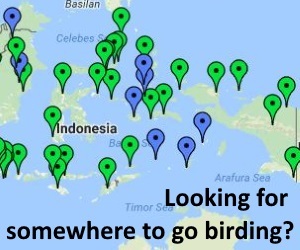 The Sunda Straits can be great for pelagic birding. At the northern end of the straits, at the narrowest point between Java and Sumatra, the sea is shallow, but heading south of Krakatoa the depth drops rapidly to several kilometres deep in the Java Trench that runs east west along the southern coast of Java. Several species of seabird regularly migrate through the Sunda Straits, including Streaked Shearwater, Wedge-tailed Shearwater (in smaller numbers) and Swinhoe’s Storm-Petrel. August-September is the peak time for this passage, and birds can even be seen from the Java-Sumatra ferry. There is also a regular traffic of Christmas Island Frigatebird as they move towards foraging grounds in the Java Sea, and they can be seen anywhere in the straits. To see a greater range of species a boat charter to the deeper water is the best bet. As well as the species listed above, here there is a better chance of Wilson’s Storm-Petrel, Matsudaira’s Storm-petrel, Bulwer’s Petrel and Skua’s. There is also a chance of seeing some of the really rare Indian Ocean specials, including Barau’s and Jouanin’s Petrel. 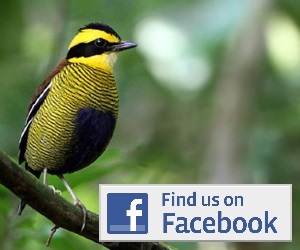 Both of these species have been recorded in this area. A number of other species, as yet unrecorded, should also be possible, including Abbott’s Booby, Flesh-footed Shearwater, White-faced Storm-petrel and Black-bellied Storm-petrel. June, July and August are the best time for a trip to the deep water, as this coincides with favourable winds from the Indian Ocean and the peak up-welling over the Java Trench and sea valleys that reach into the Sunda Strait. The easiest way to see seabirds in the Sunda Straits is to take a Java-Sumatra ferry. Boats run every half-hour or so 24 hours a day between Merak in Java and Bakuheni in Sumatra. Make sure you go for the slow car ferries, rather than the fast foot passenger boats. Tickets can be purchased on the quay-side and the crossing takes around 2-3 hours. To get to the deep water further south, there is no real alternative than chartering a boat. As the sea can get pretty rough the further south you venture, you are also as well to try and charter quite a big boat! From any hotel around Carita people will try and sell you a ride to see Krakatoa, but these trips are usually in quite small open-top boats, and not really suitable for a deep water trip. There are several sport fishing charter boats available in the Sunda Straits and these are the ones to go for. The main places to find a charter are Carita (in the small harbour shown on the map), Anyer, Labuan and Tanjung Lesung. You could simply try the harbours at these places and see what you could pick up on the day, but it is better if you can arrange a date in advance. If you are looking for details of boat charters it is perhaps simplest if you email us and we will try and put you in touch with some boat owners. You should expect to pay around Rp 5 million a day for a decent sized sport fishing boat that sleeps up to eight people. Bigger boats are also available. Once out to sea, head for the triangle between Tanjung Cina, Tanjung Belimbing and Krakatoa, or just head out into the Indian Ocean! To access the general area around Anyer, Carita and Labuan see site information under Carita. Hotel accommodation and food is available all along the coast road.